T.A.A.U. stands for Tropical Australia Algae Utilize, meaning the only company in tropical Darwin for Human consumption Algae research and commercial production base. 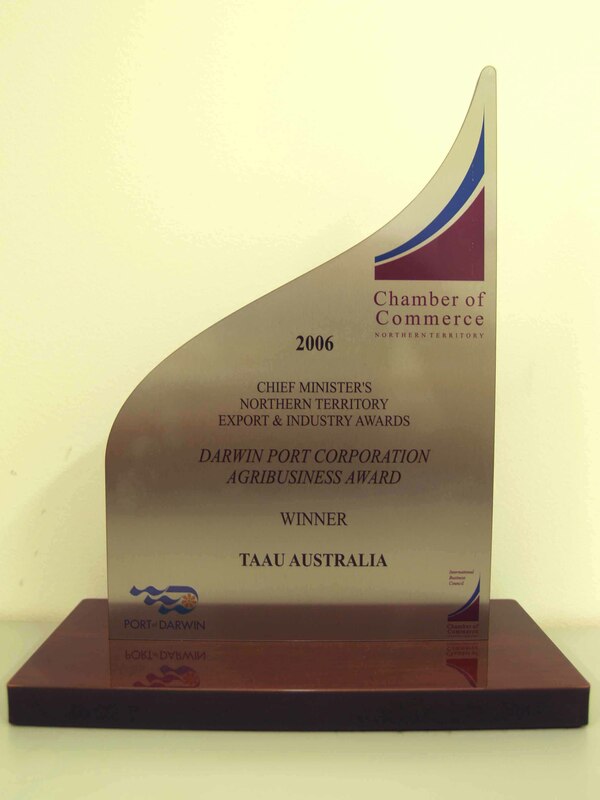 TAAU Australia Pty Ltd was established in 1996 and is the only company licensed and patented (with a 20 year Australian Patent) to commercially grow the health food Spirulina in Darwin in the Northern Territory of Australia. 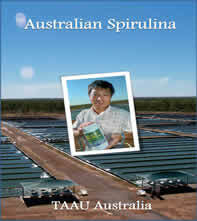 Australian Spirulina is 100% local and 100% Australian made, not imported. We do not use any herbicides or pesticides while growing Spirulina. Our product grows in pure pollution free ponds, and are fed only top quality nutrients in crystal clear mineral water. 1996~1997 submitted the company proposal to the Northern Territory Government Departments, (Land Department, Environment & Water resource Department). The most important part of this proposal was to apply for the import permit of the Spirulina live culture from Taiwan under Darwin Aquaculture Centre assistance. 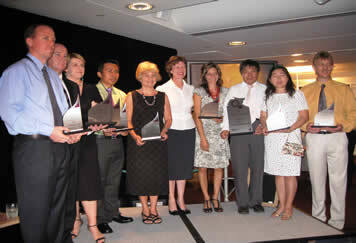 The funds injected up to this stage were about AU$200,000. 1997~1998 The Business plan was approved and suitable Crown land was found. The construction and land development plan began and the first testing bore (to ensure water quality) and the first building was finished, which included labs and a warehouse. Up this stage the funds injected were about AU$500,000. 1998 ~1999 Received the live culture from Federal Government Quarantine Authority and began lab experiments. On site small research and experiments were carried out and a small scale of pilot ponds and growing facilities were set up. At this stage the mission was to find the best formula and other growing factors to suit the local conditions. 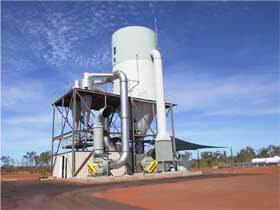 About AU$1,000,000 was invested up this stage. 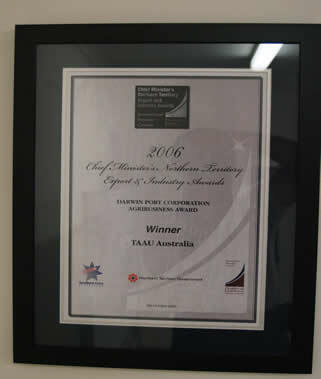 1999~2000 The initial R & D was completed and company internal assessment of this project were positive and successful. A company board meeting made the decision to bring the project into commercial production and to start expanding the facilities into commercial scale. 96 (50 M X 10M) growing ponds and seeding ponds were constructed. A contract for the key equipment of the whole project - the Spray Dried System was signed and the accumulated investment at this stage was about AU$3,500,000. 2000~2001 Small scale production was carried out. An attempt to apply for a patent for related R & D was achieved from our experimental results. All the equipment imported from overseas was assembled and we started the small scale commercial pilot to ensure the system would work as well as originally expected. A small volume of the trial product was successfully yielded from the growing facility. The trial sample was sent to several individual Labs, and all the results collected from all of the labs confirmed the product met high standard requirements. 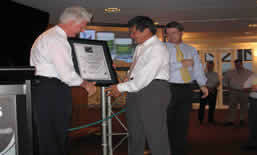 A Growing patent application was submitted to IP Australia. 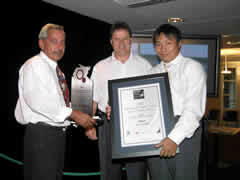 The first year trial produced about 4 tonnes of Spirulina powder which was exported to Taiwan before the end of 2001. The accumulated investment now was about AU$4,000,000. 2002 Trail mass production started, the scale of production was 50 % of full capacity. The goal for this stage was to try to get more data to accurately work out the real running costs, (fertilizer consumption rate, exchange rate for product yield, labor costs, gas and electricity costs etc.). The production for year 2002 was about 20 tonnes of dried powder. To increase the products value the company began planning to set up a tablet making plant on site, and try to turn the powder into tablet form and package them on site. Due to production costs being higher than Asian countries such as China, India and Thailand, the company here had to concentrate on higher quality and value of the product and market. Working with other Science based research organisations for human medical purposes, we provided special samples for research and achieved some milestone progress. We believe we can create another high addition value market in the future if human tests are completed. 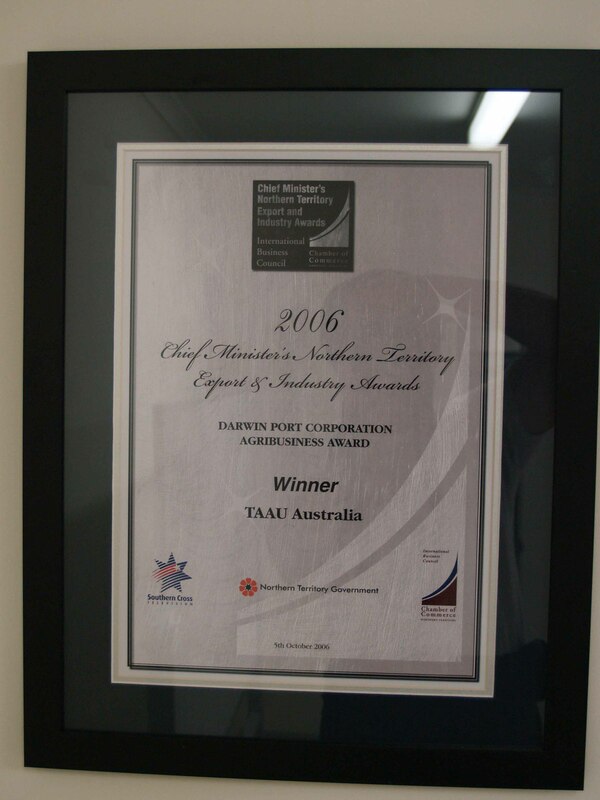 We received 20 years of Australia Patent application grant from the Australia Government. We will apply for a world patent in the near future. 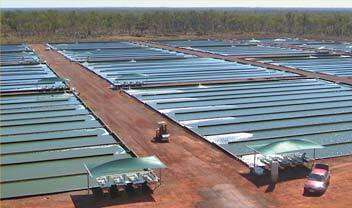 2003 The tableting facility is finished and has been approved by Health Department for Spirulina production. The trial tableting system is successful. The company product's Logo been design and registered. 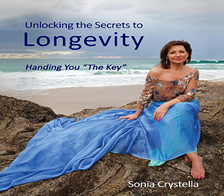 The products is ready to launch to the market. We expect total production will reach 50~ 60 tonnes this year. 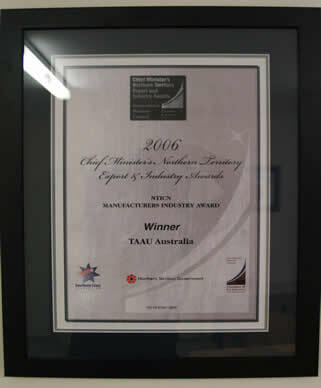 2003 Sep, TAAU Australian received Australian Government R & D taxconcession grant. 2003 Oct. TAAU Australia is the winner of year 2003 Australia NT Export award Emerge Export Award Winner. 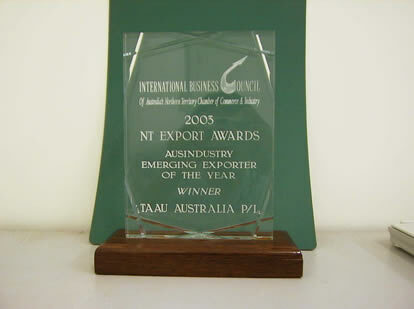 2003 Nov. TAAU Australia was final list of Australian Exprt Award . Certificate of Australian Export award finalist. 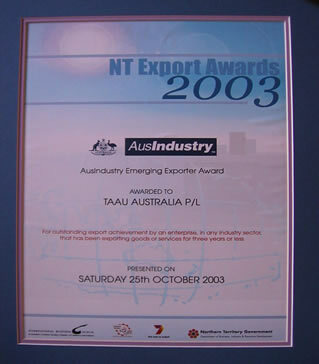 2004 Jul , TAAU Australia's successful export story published on Austrade official website. 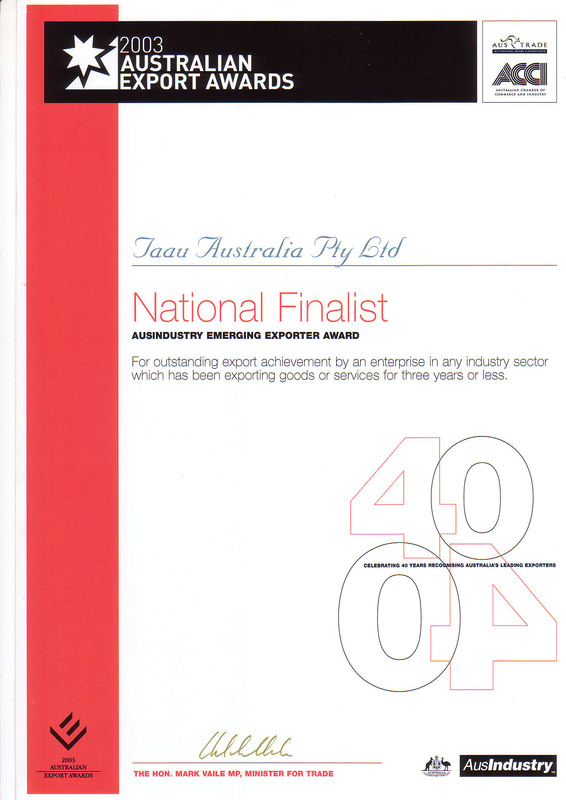 TAAU was Australian Northern Territory Export Award finalist, again! 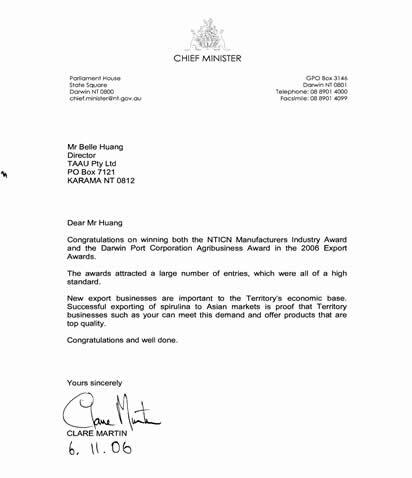 TAAU Australia Pty Ltd, R& D ( Research & Development ) team, Mr Bell Huang and Mr Gary Huang were nominated as Northern Territory Innovation award finalists. 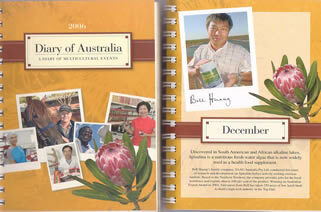 Company team leader Mr. Bell Huang and TAAU Australia's business success story published on the Australian Government printed "2006 Diary Of Australia - A Diary Of Multicultural Events". 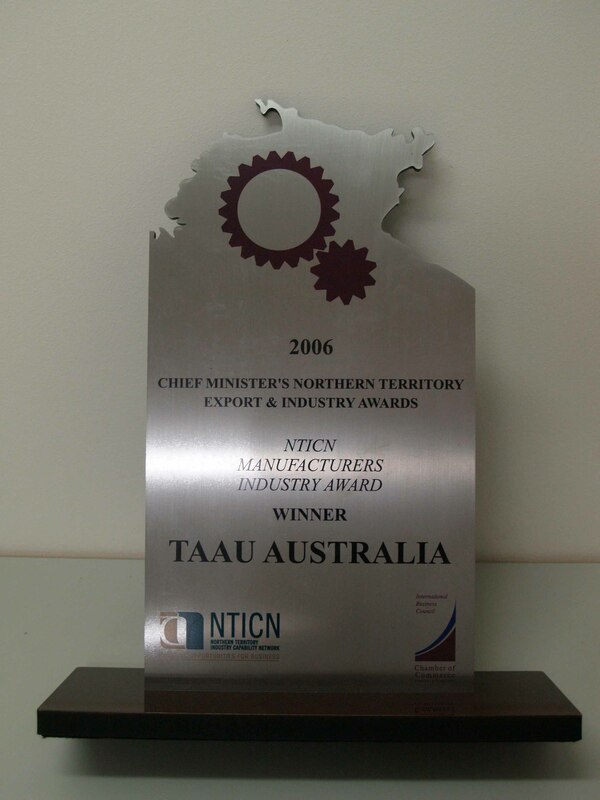 TAAU Australia and company Team leader Bell Huang's story has been published on Northern Territory Government Quarterly publish magazine " Territory Q"
TAAU Australia Pty Ltd won 2 of the 2006 Export Awards, both NTICN Manufactures Industry Award and Agribusiness Award again!
" 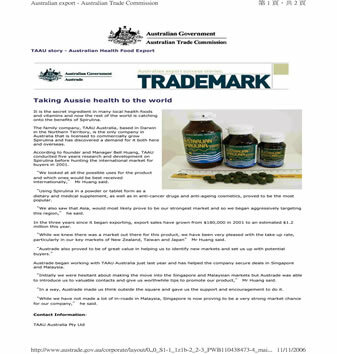 New export business are important to the Territory's economic base successful exporting of Spirulina to Asian markets is the proof that Territory businesses such as yours can meet this demand and offer products that are top quality "